This post was created to help answer some of the common questions about oil that so often passes through this forum. Keep in mind that all modern API approved oils are high quality oils. Honda recommends an API service classification of SG or higher for our Shadows. If you own a newer model Shadow you may find that Honda has changed the API requiremments, check your owners manual for the correct API classification!! Q. Can I use automotive oils in my Shadow? A. Yes, anytime you use automotive oil it is referred to as ‘Non motorcycle specific oils’. If you’re going to use these oils just keep a few things in mind. (1)Be sure you buy an API certified oil. (2)Check the bottom half of the API seal, if it has the words ‘Energy Conserving’ then its probably better to pass on that one. (3)If you do use an automotive oil you might want to reduce the mileage between oil change intervals. Q. Can I use a heavy-duty truck oil like Mobil Delvac or Shell Rotella-T? A. Yes, these oils are becoming quite popular among motorcyclist. The additive packages used in these oils more closely match the additive packages used in or claimed to be in the motorcycle specific oils. The truck oils are API certified unlike many of the motorcycle specific oils that only claim to meet a certain API certification. The truck oils have API certification codes for both diesel and gasoline engines. 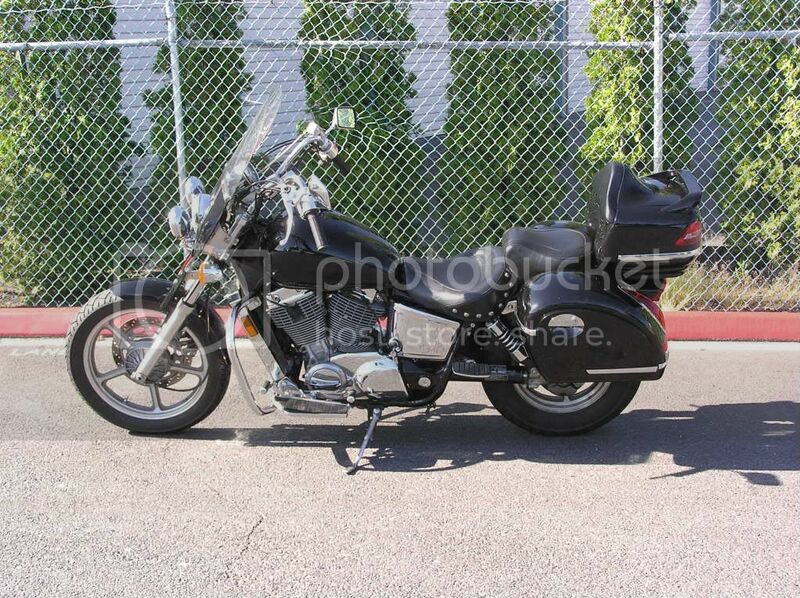 You can also go the same mileage between oil changes that you would with a motorcycle specific oil. These oils are designed for higher mileage applications. Q. Can I use Synthetic oil in my bike? A. Yes, there isn’t anything about synthetic oil that would make it not useable in our Shadows. Now that’s not to say that synthetic oil will work in everyone’s bike because some engines and some riding conditions just don’t match up well with certain types of oils. That also goes for any oil, synthetic or crude. Q. How many miles should I have on my bike before I can change to synthetic oil? A. This question always gets some wild answers. If you wait until the first 600 mile service then you should be fine. The statements of having to go thousands of miles before you can switch to synthetic oil are nothing more than myths. Q. Can an engine have too many miles on it to change to synthetic oil? A. The oil manufacturing companies say ‘No’ but I disagree with their claim. There are countless testimonies of people developing oil leaks and rattles after changing to synthetic oil in late life high mileage engines. The rattles are not nearly as common as the leaks. The problem is that there isn’t a set amount of mileage or time that marks the point of being to many, or to long. What most people would call low mileage I would say would be fine, 20,000 miles or so. As for age, I would call any engine that is over ten years old an older engine and for sure any that was manufactured pre 1990. The reason I say pre 1990 is because the crude oils of that time (or up until that time) could have well plated the inside of the engine with more varnish than the later dated oils. You might very well be able to switch to synthetic oil in a much older vehicle with a lot more miles on it than 20,000 and not have a problem at all. But it gets to be like the rolling of dice: sometimes you win, sometimes you lose. If you have an older bike that has a fair amount of miles on it and it’s running good, then I would say, ‘Let the sleeping dog lie’. Q. What’s the best viscosity range of oil to use in my bike? A. 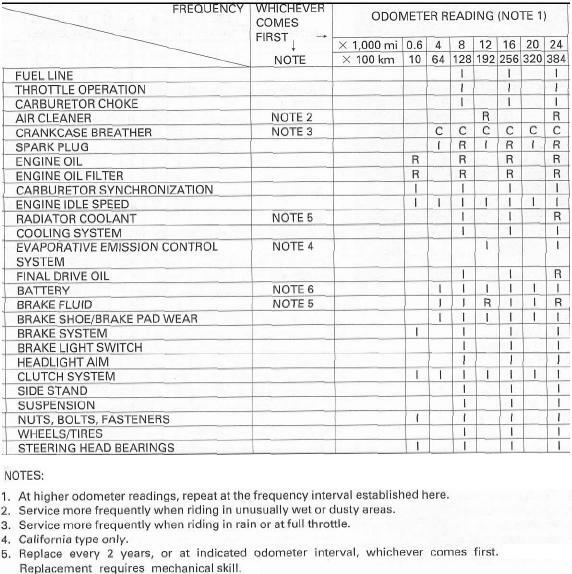 The below chart was taken from the Honda OEM service manual covering the 1997-2004 Honda VT1100C Spirit, you can see that under certain conditions other viscosity oils can be used. Its my understanding that the manuals for the much newer model Shadow's don't list or show as many viscosity choices, so if your bike is still under warranty then you may want to stay within the viscosity range listed in your owners manual for at lest the warranty period. So based on the information in the above chart we can see that Honda recommends using 10W-40 oil for what is considered ‘Normal riding conditions’. That does not mean you have to use that, nor does it mean that a 10W-40 oil is the best for your riding conditions. It’s quite possible that you could choose an oil with a more dedicated viscosity range. The recommended 10w-40 oil is the most universal oil or the one oil that covers the widest temperature spread between different climates. A good crescent wrench will fit the 13mm bolt, but not as well as a good 13mm six point socket will. If you’re not going to be starting your bike (cold starts) in temperatures below 20 degrees (f) then you could move up to a 15W-40 oil or even a 20W-40. The same thing applies to the high number listed for the oils viscosity range, except on the other end of the temperature range. If you don’t do a lot of extreme hard riding in extreme heat like above 110 degrees (f) then you probably don’t need an oil with the high number above 40. What about those that do ride in the extreme heat? They would be more concerned about the high viscosity number. They would do better using an oil like, 20W-50 or even a 15W-50. Q. Can I use oil additives like Slick-50, STP, Lucas, ect.? A. Products like "Slick-50" contain Teflon or high amounts of Moly which is or could be refered to as friction modifier's. These products can have an adverse effect on wet clutch system's, so the general consensus is to stay away from added friction modified products! Now for the other products, STP, Lucas, Motor Honey. I have heard these refered to as "Mechanic's In A Can" (that was in making fun of them LOL) And the general consensus on these is they serve no REAL purpose in an engine that is in GOOD!!! working order. If your engine is running clean, no rattles, not burning oil then DON'T use these in your motorcycle!. Now there is a place for some of these products, engine builders will sometimes use them for a pre-lube for certain parts. Someone might try it in an older engine that is getting loose, one with higher mileage that is starting to use a bit of oil to maybe try and extend its later life miles to some degree. Another thing about the heavy weight sticky stuff is that its so thick that when you mix it with your oil if will increase the oil's viscosity, so keep that in mind! if your running a 20W-50 oil and you add in any of the sticky stuff the 20W-50 just went up??? And last but not lest! From what I can find out NONE of above products has really been proven to increase an engine's life (in keeping it at a level of GOOD performance). I noticed an add for one of them just the other day that stated "And Possibly Increase Your Engine's Life" They used to boast all kind of claims! Not any more, just "Possibly". Q. What is a good mileage to go between oil changes? A. The Honda owner’s manual for my ‘97 1100 Spirit states 8,000 miles. There seems to be two understandings of this recommendation. (1)Honda recommends 8,000 miles, so that is what you are supposed to do. It’s a good thing. (2)The recommended 8,000 miles is a Maximum amount of miles to leave the oil in the engine. Number 2 would be the more correct answer. Think about it like this. If your bike is still under warranty and you go beyond the recommended 8,000 miles before you change the oil it can jeopardize your warranty. Some live with the belief that whatever the owner’s manual states is an absolute! In a way it is, if you think of it as the absolute Max number of miles and beyond that can cause damage to your engine. That tells me that an oil that is left in our Shadow engine’s for 8,000 miles has out lived its usefulness. Here is what I recommend for the mileage between oil changes. Automotive oils = 2,000 to not over 2,500 miles. Heavy-Duty truck oils = 3,000 to 3,500 miles. All Synthetic oils = around 5,000 miles. The above listed mileage’s does not mean you should let used oil rest in the bikes engine during long periods of storage. Q. I bought some extra oil on sale, how long can I store it? A. The actual oil doesn’t really ever-go bad but the additives can. I sent out an email to the Shell Oil Company with this question, they informed me that an unopened bottle of oil has a shelf life of five years. They went on to say that it is possible that oils that old may still be usable, but it should be tested first. Q. What’s the correct way to check the oil in my Shadow? A. From the Honda OEM service manual. “Start the engine and let it run for a few minutes. Stop the engine, remove the dipstick and wipe the oil from the dipstick with a clean cloth. The important points to remember is that the motorcycle Must Be on level ground and in an upright position not resting on its side-stand. Next, to properly read the oil level on the dipstick you Must Not screw it into the engine, the dipstick is to only rest on top of the dipstick hole. One other thing to keep in mind when checking the oil. There is an O-ring on the dipstick (above the threads) and sometimes when you remove the dipstick the O-ring may cling to the engine case, if you leave it there when you rest the dipstick on top of the hole to check the oil the O-ring will hold the dipstick up to high and cause a false "LOW" oil reading! So when you remove the dipstick besure the O-ring comes out with it. Q. How do I correctly read the oil level marks on the dipstick? A. It’s really no different than the reading the dipstick in a car. The Honda service manual states that when the oil is Near or Below the lower mark that you are to remove the filler cap and fill to the upper mark. That means that if the oil is somewhere reasonably between the upper and lower marks on the dipstick then the oil is at a safe operating level. That leaves the upper mark on the dipstick as a max fill line, still safe but Max. Caution! Do Not over fill the crankcase with oil, doing so can damage the engine seals. In an effort to make this topic as helpful as I can I thought it might be a good idea to add the Maintenance Schedule here for some of the different model Shadow's. Click the chart image's to see the best details! The below link is to a very good web page covering information about oil filters and a oil filter cross-reference guild for different filters for our Shadows. Thank you, thank you. I've gone back to re read this more than once. great for new owners. A while back-my mechanic told me that there is some sort of reserve area and you have to be sure to fully drain the oil or else you would get a 1/2 quart left. Something about leaning your bike while it drains or something. Anyone hear of this. On another note-I no longer go to that garage...for various reasons. No, I've never heard of that! but, the service manual states two different fill capacities, one with an oil & filter change. Is it normal for a new bike to use oil. I have a 2007 1100 spirit and I notice th oil level was down on the dipstick. I had the 600 mile service done and the bike now has 2400 miles on it. I checked it the other day and it barely showed onn the dipstick. (checking it on a level surface with the bike upright and not threading in the dipstick) I added about a half a quart and now it reads full again? Thanks for any replies. I didn't find any info on this in the Oilology thread. caution On these bikes there is an O-ring on the dipstick, it is suppose to come out with the dipstick and stay in place above the threaded part, BUT! many times the O-ring will stick to the engine case, when this happens and you insert the dipstick back in to check the oil the O-ring will hold the dipstick up WAY to high and cause a low oil level check! Re-check your oil, check to make sure the O-ring is on the dipstick above the threaded part. NOW!, if you check it correctly and its not OVER FULL! (it should be) then I would contact the dealer and tell them that you had to add a fair amount of oil to your bike and a little more than you feel would be normal. Thanks mark. Yes, the o ring was @ the top of the dipstick when I pulled it out. I'll keep my eye on it. Bike is still under warranty. We all would do well to review this.. It is a long read but well worth it. His page has a ton of factual info.